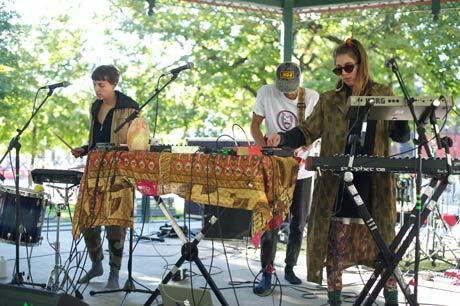 Following the ethereal sounds of Seoul, Toronto's Doomsquad began their set with some delicate riffs, guiding the crowd into patches of beautifully textured samples and fuzzed-out bliss. The front section began to lightly sway, slightly hypnotized as vocal mystics Allie and Jaclyn Blumas awoke the spirits needed to bring their ritualistic pop to life on stage. A little girl in a Minnie Mouse jacket and purple shades had no problem being the unofficial dancer for the trio, while all the adults stayed trapped in the thick swells of reverb delivered by guitarist Trevor Blumas in the first half of their set. The latter half saw the band get a bit more upbeat with their gloomy banger "Eternal Return" and the psych pop track "Waka Waka," both of which kept the audience groovy and energetic. They concluded their set with bigger sounds, rumbles and serene blips, a perfect parting gift for their fans.